Weekly Update 2017-46: Nostalgic thirst for Of Montreal, finding my way to accepting the design of coat pockets, and visiting backstage at Massey Hall. One of those bands that stands the test of time for me is Of Montreal. Perhaps surprisingly not from Montreal but rather Athens, Georgia emerges Kevin Barnes, a majestic genre-hopping fantasyman with a knack for writing enchanting and nonsensical lyrics that seem to explain exactly how I'm feeling. Not to mention, I have a vivid memory of hearing songs from 2007's Hissing Fauna, Are You The Destroyer? on Radio Blog Club and then setting out to the mall to buy the CD from HMV. It was something like $20 which was certainly worth the lovely artwork and interestingly unique jewel case alone. I digress. Every album is something new, with inspiration from funk to 60s psychedelic to acoustic Bob Dylan, and everything in between and beyond. I hope I'm not overselling. You may know my love of live albums, one of the reasons being they show a good range of genre-hopping musicians’ ever-changing styles, and another that you can hear the lead singer's banter. Kevin has good banter. This was an insane week. My job is the cause of most of the insanity, which involved coming up with a concept for the company holiday card, preparing for a presentation during a client meeting, and having the first check-in at my job (hosted by the President AND the CEO of the company at the same time). Intense. I got through all of it virtually unscathed, which I am honestly still surprised about. I hope it keeps going. Thanks to a recent communication workshop I took called How To Talk To People About Things, I also did something socially that I'm really proud of, but is much too private to share on this blog (since I know some people who read it)! I'm writing this here in the hopes that my future self will remember what it is, and also a little bit to make you think I'm cool and mysterious. The craziness at work has yet to end; I will be running a design exercise during our next client meeting (on Thursday) and I am waaaay nervous about it. I'm happy our clients are so awesome and positive about working together, which makes the space somewhat safer, but I have never done anything like this before. It reminds me of the quote “Do one thing per day that scares you”, this one may last me a couple of days. I'm also going to do my darndest to help my friend Sasha finally launch our app FriendCanoe. This Sunday, after the Santa Claus Parade, I'll be locking myself in a room (or possibly the library?) to work on the CSS and start designing some of the leftover assets. We're entering the project into a WFH hackathon that finishes at the end of the month, so I'll be crunching to get it done. I've noticed that people who wear purses definitely have varied feelings about them. I am no exception; I like to mate for life with my purses. By this I mean, I search forever until I find a purse that fits all (or most) of my parameters – usually at Value Village, where I can't get another when I eventually wear it to death because I detest switching all my items between purses. I finally gave into the cold weather a few days ago and donned my winter coat. I don't usually like to give in so early before December, but I am biking into the recesses of the cold weather this year and caved. This coat got me thinking – it has labelled pockets and pockets that are otherwise designed to denote that they have a specific purpose. Isn't that kind of presumptuous for a coat? Coat, who are you to tell me where to put my keys, my phone, my ID? But then, I realized that the coat designer had (hopefully) made a thoughtful and well-researched design decision to architect how and where I would store my various items. Since I am naturally careless with my belongings (I'm working on it), I realized that this was actually a godsend. The coat had already figured out where all my things should go, and had even included little signs to remind me in case I forgot. And you know, it hasn't made one bad suggestion yet. 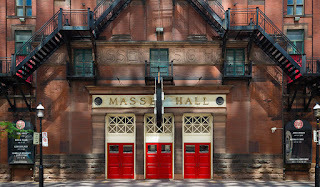 On Sunday I had the immense pleasure to visit Massey Hall in a way I have never had the chance to do before. One of their rare open houses, this event featured a look inside some of the backstage areas of the venue, as well as some old artifacts from the venue's past. The view of the audience from the stage! Above all else, I was excited to hear a wonderful historical music lecture from the illustrious Rob Bowman. Bowman is a music professor at York University, and I had the good fortune to take a class of his during my school days. Listening to him talk about all the amazing events that have taken place at Massey Hall since its opening in 1894, I was teleported back to university and hearing him paint such vivid pictures of concerts and musical happenings that changed the history of music. There was also a lego model of Massey Hall (post-reno) and a really cool virtual reality exhibit, where visitors could us VR headsets to explore what Massey Hall will look like following the seven-year renovation that has already begun, Sadly, Massey Hall will be closed for an an 18-24 month period while some of these renovations take place, but it is set to restore some lovely stained glass windows, as well as expanding Centuries Bar (in the basement) into a nicer lounge to socialize and an intimate venue setting. There will also be an additional venue added to the future fourth floor of the building, for a total of three. 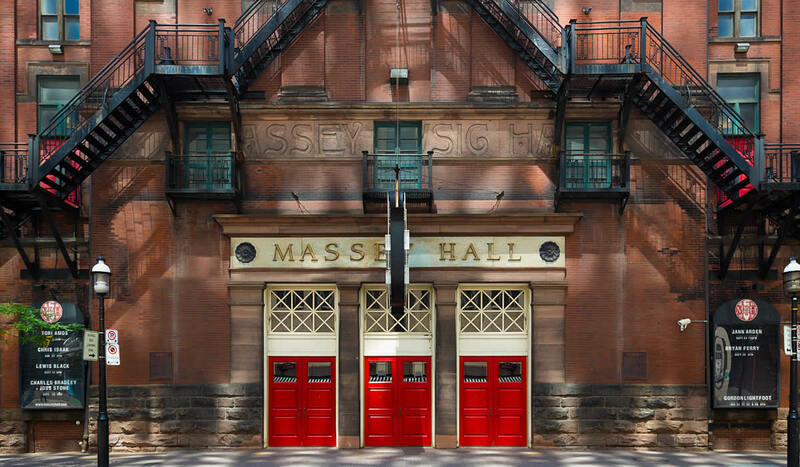 While Bowman's talk was very inspiring to see so much history in one place, I am at the same time very excited to see what Massey Hall will look like when it is complete. VR just can't do it justice.